Interested? Just give Nathan or Sam a call on 02476 703900 for more information. We can take your old bike as part exchange and even settle any outstanding finance. At Kestrel Honda our aim is to make buying your new 2018 CRF450R as easy as possible and our experienced sales team will be with you throughout the process! Everything can be organised for you over the phone if you haven’t got time to visit us, although if you do we promise to put the kettle on! Nationwide delivery can be arranged, just talk to us about what you need when you call. Finance is made available subject to application and status. If you are under 21 years of age, then a parent or guardian will be required to apply for the finance jointly with you. 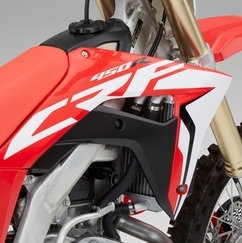 The figures above assume finance is made available on the 2018 Honda CRF450R by Honda Finance. In the event that another finance company is used then interest rates and terms will change.